Read more about Mark’s update from Douglas here on his blog. 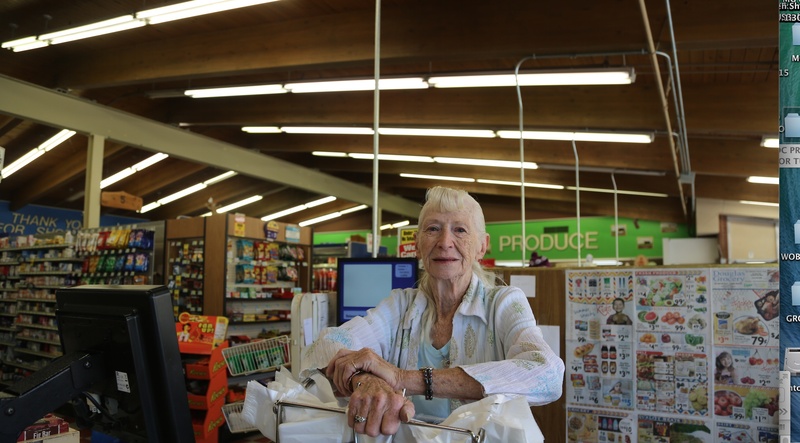 MELODY UPDATE: While Mark was riding, I met some interesting people including Bonnie, a grocery store cashier who has worked at Douglas Grocery for 10 years and Stacey, the owner of a second hand shop. Bonnie used to be a supervisor in a women’s prison for many years, but that was a rough job. Later she became a police dispatcher (also a rough job). She lost her son 30 years ago in a car crash and it still hurts every day. As a cashier, it also hurts to see people she knows who have lost their jobs in mining industry and have had to go on food stamps. That makes her sad. What makes her feel alive today is visiting with her grandchildren. I also met Stacey, the owner of a “This and That” second-hand shop in Douglas, Wyoming, that looks like a giant garage sale in a store. Their motto: “We have things you don’t know you need.” I loved browsing through everything in there and would have spent hours in there if I didn’t have to meet Mark (who had been lost, see his post above)! I even bought some trays and a coffee mug, much needed things I didn’t know I needed on this road trip. The thing I love about Stacy: she told me that every item in the store has a story, and that’s why she loves having this shop. You can certainly feel that when shopping there. Even the VHS tapes behind her have stories and love (and yes, people still buy them for 10 cents a pop!). Thanks, Stacey! PS: You can also follow “55 and Alive” on Facebook here for more pics and stuff. So, Tune, what’s the story behind your new coffee mug and trays? ?